These recipes, ideal for weekday lunches, are from 150 Best Meals in a Jar by Tanya Linton. 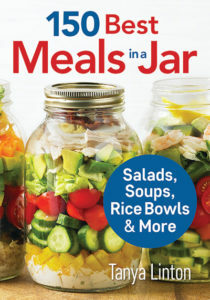 In this book she demonstrates how you can prep your lunch at home using a one-litre canning jar as the storage container. Canning jars are the perfect vessels for taking healthy and delicious soups and salads to work. You simply layer the ingredients in the jar and then add boiling water to the soup mix or turn the salad into a bowl at school. These recipes store well in the fridge, so you can make several days’ worth of lunches ahead of time. Then all you have to do is “grab and go” on your way out the door. Tanya has created recipes for breakfasts, snacks, soups and desserts, as well as a chapter devoted to rice bowls. The recipes include leafy green salads like Waldorf Salad, Asian Slaw with Honey Ginger Dressing or Layered Caprese Salad and heartier meals made with legumes, noodles or grains, such as Roasted Broccoli and Chickpea Salad, Roasted Pasta Puttanesca or Quinoa with Beets and Pomegranates. This soup is a fresh take on a traditional soup in a cup. Bring the jar to work and just add boiling water. I like using snap peas and bean sprouts, but any crunchy vegetables will do. 1. Add bouillon, hoisin and hot pepper sauce to the jar, coating the bottom. 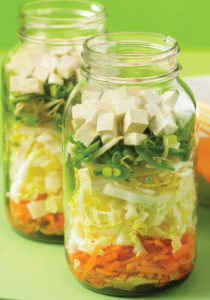 Layer carrots, cabbage, bean sprouts, peas, green onions, ginger, tofu and sesame oil on top. Seal jar and refrigerate for up to 2 days. 2. When ready to serve, stir in boiling water and let stand for 2 minutes before serving. To “julienne” means to cut into matchstick-shaped pieces. For the carrots in this recipe, trim off the rounded ends of each piece, then cut into 3 mm (1⁄8inch) thick strips. Cut the snap peas on the diagonal into 3 mm (1⁄8 inch) thick strips. It’s best to pack this soup tightly. If the jar isn’t fully stuffed, the vegetables will settle after a day or two in the refrigerator. With the back of a spoon, press the vegetables down to compact them, leaving just a little room at the top. The tofu should rest right at the top of the jar. This salad is one of my all-time favourites. Not only is it super-easy to prepare, but the combination of watermelon and feta, with a hint of fresh mint, makes it a refreshing summertime lunch. 1. Pour oil and vinegar into jar, wiping down any splashes on the side of the jar. Season to taste with salt and pepper. Layer watermelon and arugula on top, tightly packing the arugula. Top with feta and mint. Seal jar and refrigerate for up to 3 days. 2. When ready to serve, turn jar upside down in a bowl and let the dressing coat the salad.